Snipe (Gallinago gallinago). Taken at Cley Marshes, Norfolk, on October 12th 2017. Taken at Cley Marshes, Norfolk, on October 12th 2017. Snipe are medium sized, skulking wading birds with short legs and long straight bills. Both sexes are mottled brown above, with paler buff stripes on the back, dark streaks on the chest and pale under parts. It is widespread as a breeding species in the UK and most of Europe. Its breeding habitat is marshes, bogs and damp meadows, with short, dense vegetation. In winter it can be found on pool margins, ditches, seashores etc. 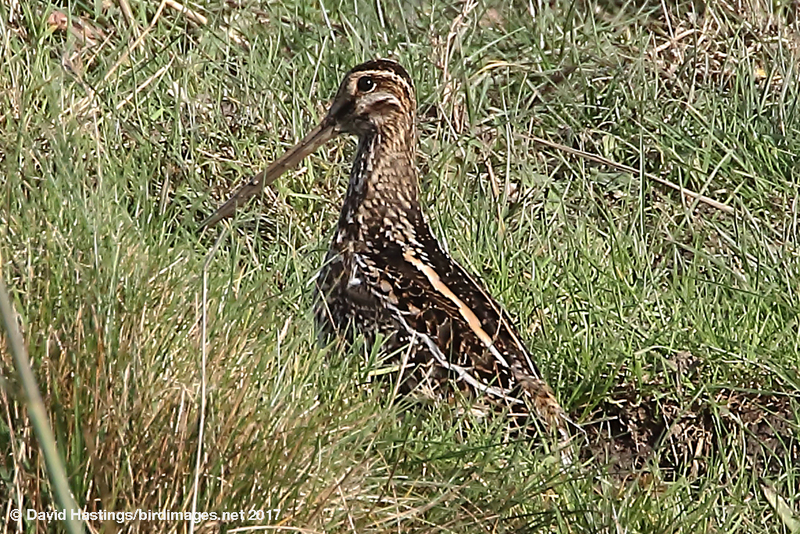 As part of its courtship display flight, the Snipe produces a drumming sound. This is produced mechanically, rather than vocally, by the vibration of modified outer tail feathers. It is on the UK Amber list because of historical declines and loss of breeding habitat. There are around 80000 breeding pairs in the UK, and over 1 million birds spend the winter here.